My father owned a bottle of Guerlain's Habit Rouge Eau de Cologne when I was in the fifth grade. I’d sometimes put on a drop or two of the fragrance, but I was mortified if someone noticed my scent. (I did not like attention directed at my person — especially anything to do with grooming — when I was a pre-teen; the words:“Somebody smells good!” and the accompanying sniffing sounds made me cringe, and fear I was about to be sullied by a pair of unclean nostrils aimed at my perfumed skin.) I outgrew my skittishness around the time I left home for New York City and college life; I often doused myself with Habit Rouge Eau de Cologne (a going-away gift) and welcomed every bit of attention that came my way. Ten years later, older, wiser and less concerned with my effect on others, I bought Habit Rouge Eau de Toilette for the first time (the original Eau de Cologne formulation had been phased out). Three years ago at the Venice airport, on my way home from vacation in Naples, Italy, I couldn’t resist a bottle of Habit Rouge Eau de Toilette Légère1 — a “lighter,” limited edition of Habit Rouge, now discontinued. This past winter, a friend gave me a bottle of “classic” Habit Rouge Eau de Toilette for my birthday. Habit Rouge and I — we go way back. Habit Rouge was created by Jean-Paul Guerlain and released in 1965; the original, rather baroque, list of ingredients (lemon, bergamot, basil, pimento, cinnamon, carnation, rose, rosewood, sandalwood, patchouli, cedar, amber, vanilla, moss, leather, benzoin, labdanum, olibanum) bears little relation to the Habit Rouge you’ll smell today. The current version of Habit Rouge smells “edited” for modern tastes, but remains instantly recognizable to those of us who have worn the fragrance over the years. Habit Rouge Eau de Toilette opens with a citrus-drenched (astringent) orange blossom aroma (think ‘fancy barbershop’) and the slightest hint of musk; subdued wood notes surround the fruit and blossoms — then vanish as lemon and orange peel aromas become active. A resin-y leather and carnation/clove accord appears mid-development and lasts a long time; this accord is followed by the scents of dry vanilla mingling with powdery and subtle incense notes. Habit Rouge dries down to piquant amber. Vintage Habit Rouge Eau de Cologne smelled a tad foppish, “dense” — yet filigreed at the same time; I always felt much older than my years when I wore it. I don’t mourn old-style Habit Rouge; I love the new ‘clearer,’ streamlined version and find it easier to wear than earlier formulations of the fragrance (and I no longer worry that people smelling my Habit Rouge-scented self will think I’m wearing garters and monogrammed button-front boxers under my street clothes). 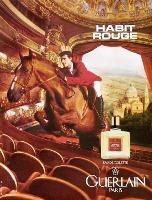 Habit Rouge has always been advertised with images of men in riding clothes (red jackets? de rigueur!) sitting atop (or galloping on) gleaming, beautiful horses. On the French version of the Guerlain website, Habit Rouge ad copy references: “hot” leather (saddles warmed by the rider’s bum and the overheated horse? damp riding boots? sweat-drenched/clenched reins and gloves? ); scents of trampled-on ground and forest; perspiring horse skin. The aromas of exercising man and beast have never come to mind when I smell Habit Rouge; there is nothing sweaty, “hair-y,” dirty or earthy about the perfume (and its leather note smells smooth and clean). 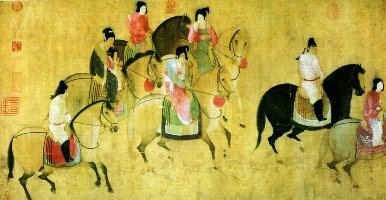 While pondering what image to use for this review, I thought of the Tang Dynasty artist Zhang Xuan and his painting of a group of men, women and children from the Tang court having a romp on their horses; the scent of Habit Rouge brings to mind refinement, ease — a peaceful and satisfying life. 1. 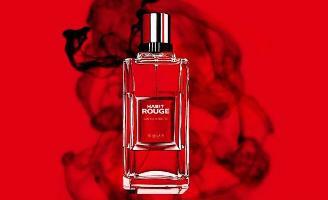 Habit Rouge Eau de Toilette Légère smells more “modern” and bright than reformulated “classic” Habit Rouge Eau de Toilette (and lasts longer on skin too); Habit Rouge Légère contains harsher, drier (and less natural-smelling) citrus top notes and perhaps a touch of ozone. Habit Rouge Légère amps up the spice (cinnamon) and dries down to a “sweet-sweaty” accord on my skin. I prefer Habit Rouge to Habit Rouge Légère. Note: top image by Zhang Xuan, Spring Outing of the Tang Court from Wikimedia Commons. Great review, Kevin. This sounds like a true classic and one I wouldn’t mind spritzing on from time to time. I loved the bit about garters and monogrammed button up boxers! Everyone needs a little fop in their life now and then, and splashing on a little baroque cologne just does the trick for when that mood strikes. As far as mens’ fragrances go, I’m just happy it isn’t aquatic, gingery, or “precious and luminous” aquatic ginger, which is appealing in and of itself. A.S.: sniffing Habit Rouge is a must! Nice review. I too love Habit Rouge. All I’ve smelled is the current version, which I find very nice, distinctive, with a dry smell that lasts a long time on me. “The Guide” describes it as “sweet dust”, and there’s certainly a dustiness in there. It’s very different from today’s standard watery-citrusy-spicy men’s perfumes, and much the better for that. So one can get an EdP in Europe? Just in France, or other places as well? Fernando: UK sites have it…don’t know about other places outside France. Hope someone will comment on EdP. I was lucky to find an EdP bottle on eBay! I agree, with these new formulations they are much “clearer” or cleaner without a lot of skank involved. The EdP, which adds the note of (synthetic) oudh in the mix, adds another contrasting facet to veil HR’s sensuality. The oudh smells musty and a little berry-like. To compare it with the EdT, the musky leather is subdued–it’s there, but the oudh only permits it to peek out time and time again, creating a sensual mystery about it. You smell something like lemony and powdery incense at one point, then bang! you’re catching hints of Guerlinade underneath it. Ingenious!!! The result is with no doubt a cleaner and less sensual impression. Even the drydown lacks that animalic facet of musk, much like the Legere version. The difference in longevity between the EdT and the EdP is about 2 hours on my skin, but in the final stages of the drydown, the EdP is a sheer trace of oudh, woods and faint vanilla , and the EdT is more noticeable with the musky amber notes and vanilla. Which brings me to think, HR has a feminine nature about it if it lacked all that citrus to pierce through the whole composition, at least by the standards of yesteryear machoism. But without a doubt, it is these sensual notes that draw me to it, and if they offered HR with citrus notes toned down to only the initial topnotes, I would certainly beg, borrow, and steal to obtain several bottles of it to last me a lifetime. I wonder if the Extrait smells like this??? The seller was selling at least 6 bottles of it on eBay US, btw. iMav: THANK YOU for the review…I’m tempted to just buy it unsniffed…though I have about 200 ml of Habit Rouge in the house now between the Legere and the new regular bottle! HA! IMAV, intersting description of the EdP… I see what you mean but need to smell it again and with concentration. I just didn’t expect something more transparent than the other versions and I was traveling so I couldn’t really appreciate it, although it certainly is my cup of tea. Extrait?! What do you mean? There is no HR Extrait available is there?! LL: there “was/is” Extrait of HR…may be exclusive to the Guerlain boutique in Paris. Sadly, if it really did smell like perspiring horse, I would LOVE it. I grew up around horses, and think they smell great. Regardless, I do need to sniff Habit Rouge one of these days. Miss KV: you do…and horses Do smell nice. I think CdG Palisander smells like being in a large airy horse barn–in a good way, of course. Crowflower: a newly built barn without the horses though…don’t get any “animal” in Palisander myself. Not so much horse as a note of “processed” hay, if you know what I mean–but in a pleasant way. Crowflower: ah, YES…I can smell that…. Perhaps French men’s bums and French horses don’t sweat while out on the hunt…or perhaps the saddle is adequately insulated by their monogrammed button front boxers…….and the leather is being gently warmed by the sun? Yes, that must be it. Habit Rouge sounds very appealing and thankfully nothing like the oodles of aquatic-y mens sport colognes that have increasingly sinus burning effect on me. Daisy: you’re welcome. All the hot leather must be Hermes…and delightful to smell! Then I must be a horse. Miss K…and I’m a woman! I have a sample of EdP and must dig it out. I received it from a fellow Basenoter and did not realize it was rare in the US. Kess: very rare…sniff it and report back! Enjoyable read as usual, gracias! Although I don’t reach for this bottle often, I enjoy wearing it when I do. C: you have to find a bottle of EdP (there OUD in it!) Dirt cheap as usual? HA! Very enjoyable read Kevin, and before I even began, I thought what a refreshingly original change of art work to illustrate Habit Rouge. LOL at the garters and button front boxers! Oh, I thought so as well. There is so often an aura of serenity with Asian art, I think. I haven’t sniffed HR yet – there are so many women’s fragrances to test, so much to catch up on, so little time… but just eyeballing the notes, it sounds absolutely gorgeous. Sigh. And thank you, Kevin, for the little glimpse of the person you are. I remember that early-teen Nobody Notice Me attitude very well, and have been watching my 14-year-old daughter enter that stage. Sigh. It does go away… how wonderful to have such a history with one scent. mals86: it is a TORTURED age…good luck! (and I bet you can get a whiff of HR at many a dept. store near you…you certainly should not have to order a sample). I used to wear Habit Rouge and loved it, but I eventually had to admit that as good as it was, it really wasn’t me (too sweet, in the way that Lagerfeld was too sweet–and I used to wear that, too). I like Habit Rouge Legere a lot more, because that sweetness had been toned down so much. It’s the same basic scent, but reworked with different, and more pleasing, proportions. Now I’m very curious about the EDP, of course. R: why are we left out of the EdP here in No. AMERICA? Harumpf. I was wondering when you were gona do a review for Habit Rouge! Great perspective on a class and it makes me want get the reformulated EDT ( I have the EDC)! I love the EDC because it’s very versatile and works in the summer weather just as well – plus I have too many winter orientals/gourmands that I didn’t want to get another cold weather frangrance. Also, I figured I could be getting another cologne in its place since the EDC and EDT are not different enough to merit getting both of them. How would you rank the the EDC, EDT and their vintage formulations? ooofireballooo: As far as I know HR EdC IS vintage at this point…don’t see it for sale by Guerlain even in Europe (though STOCKPILES of it exist for sale if you look at discounters online). I really like today’s HR EdT better than my old EdC…today’s version lasts ALL day on my skin for one thing. EdC in the old days disappeared on me within a couple of hours. I never wore the EdC (or the 90s EdT) in summer…but today’s EdT can be worn year-round I think. Thanks for the perspective on the EDT! I might get it one of these days when I can get it for cheap! If it can be worn in warmer weather (I live In California) then it would be a great addition! Thanks Kevin! Looking forward to other reviews of masculine old and new classics! Soooo Kevin, have you tried Dior Pondichery yet? hmmm? Daisy: I have NOT, oh Temptress! Are you about to tell me it’s sensational??????????? I owe you some samples…I’ll send you the two Habit Rouges that I have. Hi Kevin – nice review! I like Habit Rouge very much – it is neck and neck for me with the much moodier and sweeter Shalimar edt. Sometimes I prefer it and the drydown just can’t be beat! So soft, luxurious, powdery and warm. It’s also clean without those obnoxious “detergent” notes. I love that dry lightly sweet quality it has. I’d love this on a man, but I’ll wear it too! Anns: yes, LOTS of women love Habit Rouge for themselves and the men around them…I should have stressed the “unisex” character somewhere in the post. There was also the HR Extrait – the limited edition perfume concentration of HR from last year. Not sure if is still available and it was always a Paris exclusive. I got to smell a small sample and found it wonderful, but couldn’t quite cough up the 300*400 or so Euros for it. It seemed to me to be the elements of HR focused through a diamond prism in a very nice way. And the dry down to me absolutely linked HR to the great Guerlain feminines like Shalimar. Santemon: yes, saw that on a Russian perfume site…and nowhere else I would not cough up that amount either…so best I never smell it! Like MissKitty, I like the smell of horses! If this fragrance really smelled of horses, trampled earth and leather , I would be HUNTING THIS FRAGRANCE DOWN!!! But the notes Kevin mentions sound good to me, so I’ll look out for this. The closet I’ve come to finding anything that smells like horses is L’Artisan Dzing! But only abstractly. To me it smells like horses and 1969 Volkswagen Bug–both nostalgia smells for me. Laken…I would be hunting that scent down too…I am thinking, thinking…and can’t come up with a “horse-scented” perfume! Surely some crazy grapefruit-musk-hay-tobacco perfume with a touch of honey-pollen could approximate a horse? Of course, there’s always Brandy. Sorry, couldn’t resist. hmmmm, I think so! Oh well good excuse to keep looking! Oh, the wonders of the internet. I just found a shop not too far from where I live that stocks L’Artisan….I’ll be there a.s.a.p, or as soon as I have enough readies. Yeah, definitely try it first! It’s not for everyone. I ache for a bottle of the EDP. Coming across the extrait is probably hopeless, so best not to think of it. Donald: DdP IS available on eBAY for around 90 bucks (US) for 100 ml…but if you’re like me, you NEVER-EVER buy unsniffed!? Just noticed that eBay listing after posting my comment. It’s from a seller I’ve done business with, too. Very reputable. I’m actually visiting Europe in September, so I’ll try to sniff this and many other elusive goodies then, if I can. I’ve recently sampled Spiritueuse Double Vanille and want to get at least one full bottle while I’m there. Saving my pennies for bottles of smellies. All I want to do is visit perfume shops during the trip. My girlfriend thinks I’m insane. Maybe this is the trip that will bring her into the fold…..two perfumistas in one household….both fascinating and frightening at once. Daisy: I’ve never heard of a two-perfumista household…there always seems to be only ONE fanatic. Oh, no, no. She hates fragrances. Not just perfumes, but anything that has a smell. She won’t even eat food that has flavor. It’s a nightmare. Donald: save some money for DINNER, CLOTHES and a museum or two! HA! the Habit Rouge eau de parfum is more tarry and leathery, it is also more astringent in the drydown. As i am a fan of the classic Habit rouge and a woman it sits less well on me than the eau de toilette! Josina: “TARRY”!!!!! AH…I love tar. Must try to get a sample of the EdP! The smell of horses ? Thanks for the review! You described the scent well. When I was dating my husband and discovered he wore Habit Rouge, I knew he was a keeper! It wasa nice change from men´s typical “clean” fougeres. I wore it for a while back in the late ’60s. It was lovely, but just that little bit too masculine. I switched to Vétiver after that. I lived in Nice at the time, women’s perfumes all felt too ‘sweet’, especially in the summer. Bela: Guerlain and Nice…a good combo! Wonder if the new formulation of HR would be less masculine to your nose…. Kevin I’ve been waiting for this for long. What a coincident that I just proposed it for Chris at the Monday Mail (6. July)… Great review amd I agree on everything. My favourite part though is the picture! I think it’s a brilliant visualisation of the fragrance and your comment is spot on: “refinement, ease — a peaceful and satisfying life”! Actually in the case of HR I even like Guerlain’s description “c’est le parfum des chasseurs, même s’il s’agit de la plus tendre des chasses.”… for the gentlest hunter. What a nice line, don’t you think? The new Sport version on the other hand seems to be a bit more sweet and mainstream. I just wanted to mention that Flower By Kenzo Eau d’Ete (2006)smells like a “lite” version of HR to my nose. In the past there have been so few men’s fragrances that came in EDP, let alone extrait, so the 60 ml is quite shocking for those of us in North America! Heritage was available in EDP but not here. I seem to recall that Boucheron and YSL might have had those concentrations too. L’Instant de Guerlain Pour Homme is sometimes greeted with “It smells too perfumey!”, which I think means that it’s too strong for most men in North America. Wait till they try the Intense version! Apparently Homme will be coming out with a more intense version in the fall, which shouldn’t hurt it since it’s fresh to begin with. Actually, I just realise I’m being being really arrogant… it’s just the way it’s said, not a person’s decision. It’s just the common way to say it. I guess in German many from an older generation say Rasierwasser even if they rarely mean an actual Rasierwasser (after shave/tonic), but rather an EdT/EdC or perfume or whatever. Habit Rouge is really very classic. I fell good when wearing it and it stays.